We’ve been hearing so much about the rose milk at Kalathi Rose Milk Shop on East Mada Street and we just had to see (or taste, rather) for ourselves. Was it a win? This little shop has been around for almost a century apparently! Started in the late 1920s (Mr Mani who serves us a glass says it started way back in 1927) the shop has stood the test of time offering preservative -free, refreshing rose milk through the years and over time has gathered a huge fan following. Not sure where it is exactly? Type “Rose Milk Shop, Mylapore” in your GPS app and you’re set. 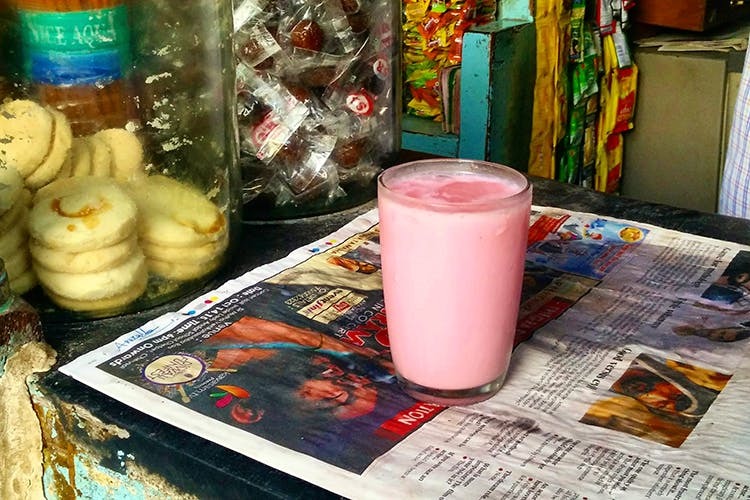 What started off as a shop selling newspapers, the kutti kadai started making news for its delicious rose milk. Apparently many celebrities back in the day too have had a taste of Kalathi kadai‘s cold drink. We’re not celebrities (yet), but we can tell you what the fuss is all about. With Chennai’s weather, a glass of chilled rose milk is all you need to recharge. And just for INR 15. There’s a perfect balance of sweetness from the rose syrup and the milk is creamy fresh. Add some ice and voila! A simple yet tasty way to wade through Mylapore’s bustling streets. We approve! They also have light snacks they keep in those little glass bottles, it's like stepping into the 60s here!